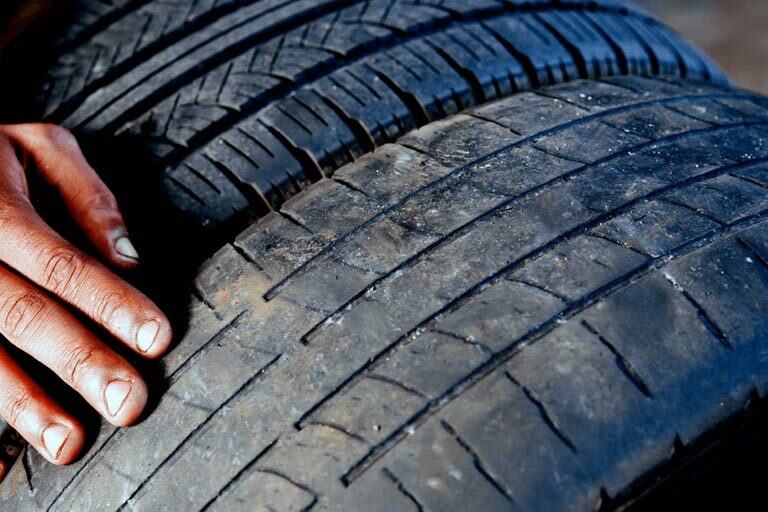 Tire wear depends on several factors, including your driving style and tire maintenance habits. Wrong size load and speed rating can void your warranty. But one sure way to know when to replace your tires is when treadwear indicators appear. A tire’s built-in treadwear indicators are “wear bars” that look like narrow strips of smooth rubber across the tread and appear when it’s time to replace the tire. Maximize your tires’ performance and durability by monitoring and maintaining correct air pressure. Air is a gas, expanding when heated and contracting when cooled. For most of North America, fall and early winter are especially important times for checking tire pressure—as the ambient temperature falls, tire pressure goes down. A good rule of thumb is that for every 10 degrees Fahrenheit temperature change, tire pressure changes about 1 psi—higher as temperature rise, lower as they fall. Also, check your vehicle’s owner’s manual for recommended tire pressure. Check your vehicle’s tires at least once a month, when the tires are cold (let the vehicle sit for at least three hours). Look in your owner’s manual for the recommended tire inflation for your vehicle. Use a quality gauge. Don’t “eyeball” tires—radial tires can look fine even when they’re under-inflated. Be sure to look for objects that have become wedged in the tread—they can work themselves further into the tire and cause air loss. And don’t forget to check the spare! It’s important to rotate your tires according to the correct tire-rotation pattern. Front tires encounter different tasks than the rear tires. And a front-wheel-drive car’s tires perform different tasks than those on a rear-wheel-drive car. Your owner’s manual specifies which rotation pattern is right for your vehicle. Your vehicle’s front and rear tires may also use different pressures—make sure to adjust individual tire pressure to the recommendation for each wheel position. See your owner’s manual for recommendations. Rust or dirt may not allow proper tightening of the lug nuts and a wheel may loosen over time. When you have your tires rotated, be sure to remove any rust or dirt from places where the wheel attaches to the vehicle and torque the wheel lug nuts to the specification in your owner’s manual. In an emergency, you can use a cloth or paper towel, but be sure to use a scraper or wire brush later to remove all rust or dirt and torque to specifications. Also, remember that rotating your tires won’t correct wear problems caused by worn mechanical parts or incorrect inflation pressures. Scheduled alignment and balancing are not needed, since your vehicle’s wheels were aligned and balanced at the factory. But if you notice unusual tire wear or that your vehicle “pulls” one way or the other, the wheel alignment may need to be reset. If you notice your vehicle vibrating on a smooth road, your wheels may be out of balance. A tire that is out of balance often affects ride quality and can shorten the life of tires, bearings, shocks, and other suspension components. A speed-dependent vibration—becoming noticeable around 45 mph and increasing as speed increases—is probably balance-related. Alignment is critical for ensuring that you get maximum wear and performance from your tires. Poor alignment results from your car’s suspension and steering system becoming out of adjustment with each other. The biggest indicators of your vehicle being out of alignment are a “pulling” one way or the other as you drive or unusual tire wear. Improper tire inflation can also cause unusual tire wear. Knowing how to change and repair it can mean the difference between making your appointment and running hours late. And technologies like tires that run even when flat and flat-fixers you can store in your trunk make dealing with that flat easier than you might think! Where should your new tires be installed? Winterizing your vehicle is a wise idea! Get money-saving coupons for Oil Changes, AC Service, or general services. We hate spam too. We will never share your email.